I adore Giada deLaurentiis. I do. I think we’d be really good friends, laughing over shredded brussels sprouts and bowls of pomegranates. When it comes to Italian food, Giada is my guru. Except when it’s Friday evening after a long week of work and grad school, and I just want a simple, quick dinner that doesn’t come from a delivery guy’s heated pouch. Surveying the fridge, I had the holy trinity of Italian food (ricotta cheese, mozzerella, and parmesan), so it could go a hundred ways. A baked ziti? Sure, but boring. Lasagne? The thought of layering cheese and pasta and sauce on this hot day makes me groan. 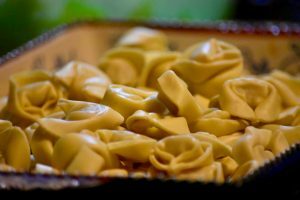 Heading into the fridge, I saw something that caught my eye – packaged fresh chicken and herb tortellini! 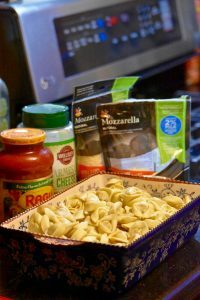 Easy baked tortellini, styled after Giada’s amazing-sounding Cheesy Baked Tortellini using the everyday ingredients I had on hand. A quick boil for the tortellini, and it’s a fast half-hour in the oven and onto the table. 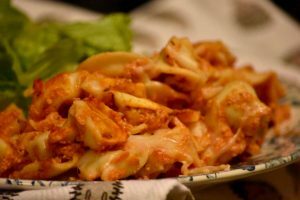 Feel free to improvise your ingredients – if you want to make it vegetarian, feel free to substitute cheese tortellini, or if you want to go meat-lovers, try meat tortellini in meat-flavored pasta sauce. Preheat oven to 350 degrees, and set a large pot of salted water to boil on the stove. Add tortellini to rolling boil, and cook for about 2 minutes to heat up. Drain tortellini well. Mix the pasta sauce with the ricotta cheese, and add the fresh herbs you’ve chosen or had on hand. 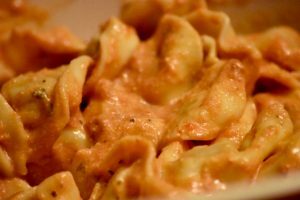 Toss the tortellini in the sauce, and turn out into a 9″x12″ baking dish. Top with mozzarella and parmesan. Bake at 350 degrees for 30 minutes, or until cheese is melted and bubbly. Serve with a green salad, and garlic bread if desired, and why not pour yourself a nice glass of wine, too. Put your feet up, and enjoy the start of the weekend. You deserve it!